Do not let your smartphone/tablet/camera buffer once you have pressed the shutter and the device takes time to write the file fully to your memory card. Go for a blazing-fast data transmission with the Kingston 16 GB Micro SDHC Class 10 Memory Card. The Ultra High Speed-I (UHS-I) Class 10 rating of this micro SDHC memory card allows for a speedy write capability at 10 Mbps and a read capability at 45 Mbps so that you can both save as well as retrieve your multimedia files within seconds. With its extremely swift data transfer, the Class 10 Micro SDHC ensures that your video cameras do not produce corrupted video files by downgrading the video quality to match the speed of a slow memory card. Your camera will not capture shortened clips by abruptly pausing a video-recording when your memory card has reached its maximum speed limit. Also, enjoy the burst shooting mode on your camera to capture a series of photographs continuously of rapid-motion scenes like pets or children with the rapid data transfer of this Micro SDHC Class 10 Memory Card. You can store a huge collection of photos, videos, movies, music, games, apps and more in the 16 GB storage capacity of the SDHC Memory Card and the UHS-I rating allows you to save even 3D and cinema-grade 1080p Full HD videos. Speedy Data Transfer Do not let your smartphone/tablet/camera buffer once you have pressed the shutter and the device takes time to write the file fully to your memory card. 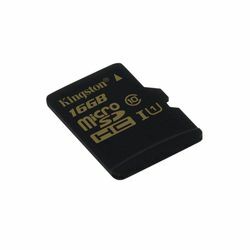 Go for a blazing-fast data transmission with the Kingston 16 GB Micro SDHC Class 10 Memory Card. The Ultra High Speed-I (UHS-I) Class 10 rating of this micro SDHC memory card allows for a speedy write capability at 10 Mbps and a read capability at 45 Mbps so that you can both save as well as retrieve your multimedia files within seconds. Special Benefits of Class 10 UHS-I With its extremely swift data transfer, the Class 10 Micro SDHC ensures that your video cameras do not produce corrupted video files by downgrading the video quality to match the speed of a slow memory card. Your camera will not capture shortened clips by abruptly pausing a video-recording when your memory card has reached its maximum speed limit. Also, enjoy the burst shooting mode on your camera to capture a series of photographs continuously of rapid-motion scenes like pets or children with the rapid data transfer of this Micro SDHC Class 10 Memory Card. You can store a huge collection of photos, videos, movies, music, games, apps and more in the 16 GB storage capacity of the SDHC Memory Card and the UHS-I rating allows you to save even 3D and cinema-grade 1080p Full HD videos.